The head of Loch Etive lies in the wild and mountainous landscape of Glen Coe, and it stretches south-west like a twisted ribbon for about 20 miles, squeezing through the Falls of Lora, a tidal race below the Connel Bridge, before it meets the sea. A single-track road threads along part of its northern shore, passing a few glamorous-looking modern houses as well as the more traditional farms. About five miles down this road, just before it finally peters out, are the ruins of one of Scotland’s smallest and most secluded priories: Ardchattan. 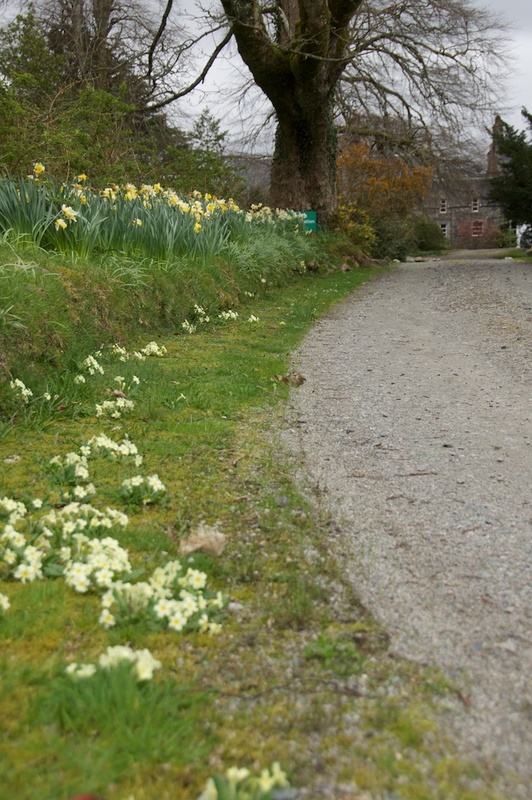 The drive was bordered by daffodils and primroses when we visited on a blustery day in April. You can park in a small gravel area just within the gates; there’s no one in attendance, but a small wooden ‘honesty box’ prompts you to pay the appropriate admission fee. It feels almost as if you’re trespassing on private property… and that’s because it really is private property, although open to the public throughout the summer. Part of Ardchattan Priory was incorporated into a house in 1602, and it’s still lived in, with the buildings and barns of a traditional working farm to one side. The lane bears round to the left, past the farmhouse, offering you the option to explore the lawned gardens that lie straight ahead or turn right into the priory ruins. Before even setting foot in the monastery I was greeted by a row of carved grave slabs, which is a sight that always makes me happy. These stones are mostly late medieval, dating from the 15th to early 16th centuries, but there is one, a Celtic-style cross, which dates from the 10th century. This is an important grave marker, and its intricate carving is slightly weathered but still absolutely beautiful. Since it pre-dates Ardchattan by at least 300 years, it is believed to have been brought here from elsewhere. The other stones are skilfully engraved with entwined foliage, possibly by craftsmen working in the Loch Awe area (whose efforts we’ve seen elsewhere, at places such as Kilmory Knap). There are two with figures on them, presumably Priors or other important church figures. 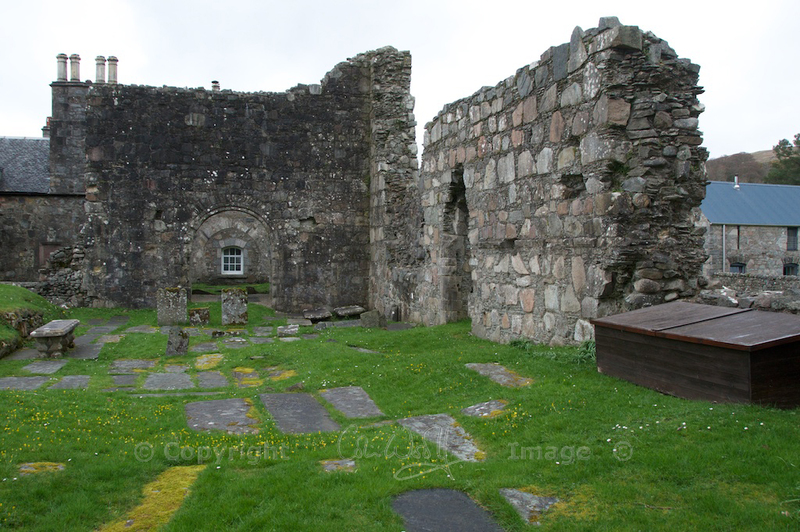 Housing a small community of Valliscaulian monks, Ardchattan Priory was established in 1230 by Sir Duncan MacDougall. Descended from Somerled and the Lords of the Isles, the MacDougalls were a powerful family. The kings of Scotland and Norway were vying for control of the west coast and its islands, and Duncan’s plan may have been to cement his relationship with Alexander II, the Scottish king, who had just founded a similar monastic house further north. Certainly, it ensured that the MacDougall clan had a controlling interest in Ardchattan, and successive generations of the family were Priors here. Originating in Val des Choux (‘valley of the cabbages‘) in the forest of Chatillon in Burgundy, this little-known order had only two other priories in Scotland: at Pluscarden in Morayshire and Beauly near Inverness. The brothers followed the strict rules of St Benedict, avoiding most manual work and dedicating themselves to prayer and silence. For their income they depended on rents and endowments. The Valliscaulian symbol is a bunch of kale leaves, and this is engraved on one of the keystones over a doorway. Only about 20 monks would have lived here, and when you walk around the ruins you realise that its builders were thinking on a modest scale. The focus was a small church, with a nave, transepts and a choir; the monks’ domestic quarters were ranged around a cloister. In such a serene spot, the peace must have been constant and profound. In 1308, having returned to Scottish shores in a bold attempt to seize the throne, Robert the Bruce blazed a trail through Argyll until only a few fortresses were holding out against him. One of these was nearby Dunstaffnage Castle, but Bruce laid siege to it and the occupants surrendered. 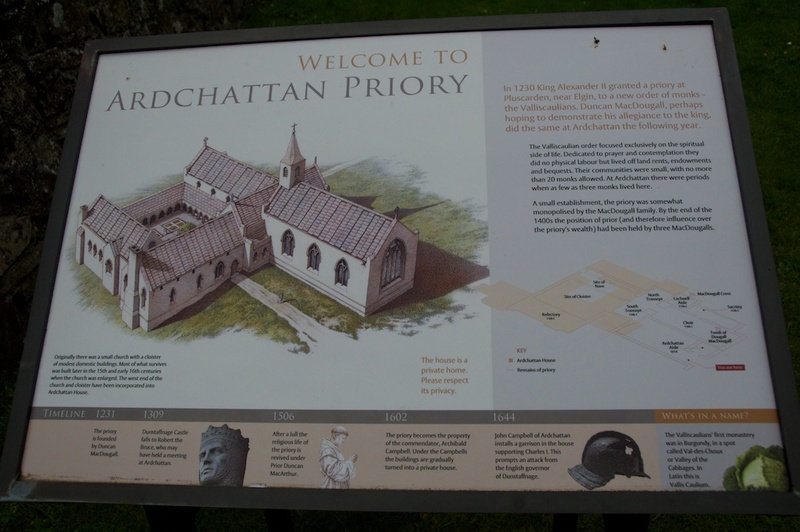 Afterwards, Bruce summoned a Council of local chiefs at Ardchattan Priory. This is believed to have been the last Gaelic-speaking parliament in Scotland. Six years later, in 1314, the sacred yew trees of Ardchattan supplied wood for the longbows carried by Bruce’s army as they swept to victory at the Battle of Bannockburn. 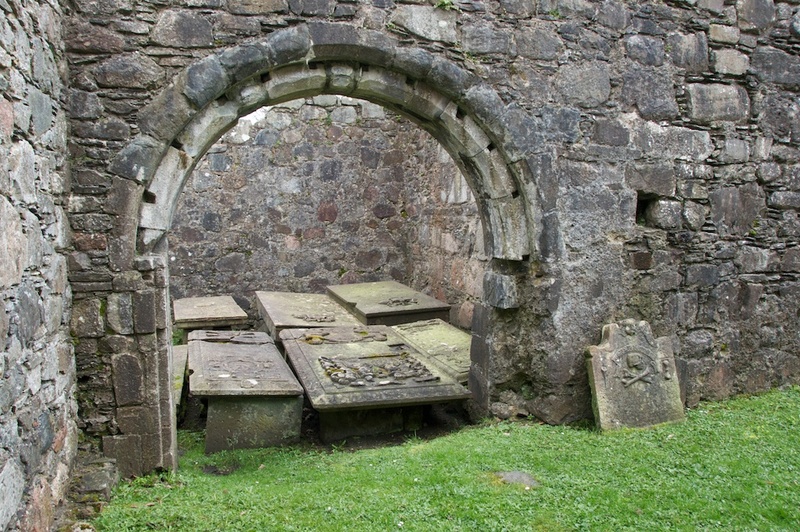 Additions to the church in later centuries included a sacristy and a larger choir, as well as two chambers known as the Lochnell Aisle and the Ardchattan Aisle, which are dedicated to two branches of the Campbells. The Lochnell Aisle is crammed with tombs, jostling each other for elbow room, and it’s impossible to walk between them. If there’s such a thing as an afterlife party, it’s all going on in there! Talking of shaking up the dead, I stepped gingerly in between the grave slabs that pave the choir of the church and went to have a look at a tomb that had been boxed in to protect it from the weather. This is the MacDougall tomb, where Somerled MacDougall and his sons are buried. However, the boxing-in had been done a little too securely – for me, at any rate – and after a few attempts to lift the heavy lid I gave up. I did give it a few furtive glances afterwards, just in case I had woken up any inhabitants and they happened to be making an exit. Just like the MacMillan Cross at Kilmory Knap and the Maclean Cross on Iona, the MacDougall Cross was commissioned by a prominent family with the aim of enhancing their prospects in both this world and the next. It was commissioned by Prior Eugenius (Eogan) MacDougall in 1500 and carved by John Ó Brolchán, a stonemason from Iona. One of the few medieval crosses to bear the name of its carver, it shows Mary and Jesus on one face and the crucifixion on the other. The MacDougall Cross stands just outside the Lochnell Aisle of the church, in what seems now to be a slightly awkward position, but of course in the 1500s the surroundings would have looked entirely different. Life seems to have gone on very quietly at Ardchattan over the centuries, but its death-knell was sounded in the mid-1500s by the Reformation, when the new and zealous Protestant movement attempted to erase every sign of Roman Catholic splendour from the landscape. Records reveal that in 1538 there were six monks in residence here, and only three in 1560. Coming into the possession of the Campbells, who were now lairds of Ardchattan, the priory buildings were gradually turned into a private home, with the old refectory being kept as a dining room. Although it is thought to have been ransacked during the Civil War, the church remained in use for worship until 1732. The atmosphere at Ardchattan is still serene and undisturbed, and in summer the gardens burst into a dazzling display of colour. Soft drizzle blows in on the southwesterly winds, encouraging fronds of lichen and lush carpets of moss. In April, I had the place all to myself, and the only sound I could hear was the bleating of new-born lambs in the surrounding fields. Ardchattan Priory is cared for by Historic Scotland, and is open daily between 1st April and 31st October. Admission is £4 per adult (children under 16 free of charge). To get there, turn off the A85 just north of the Connel Bridge, and follow the single-track road along Loch Etive for about 5 miles. Lovely photos and history, brought back my visit last year. 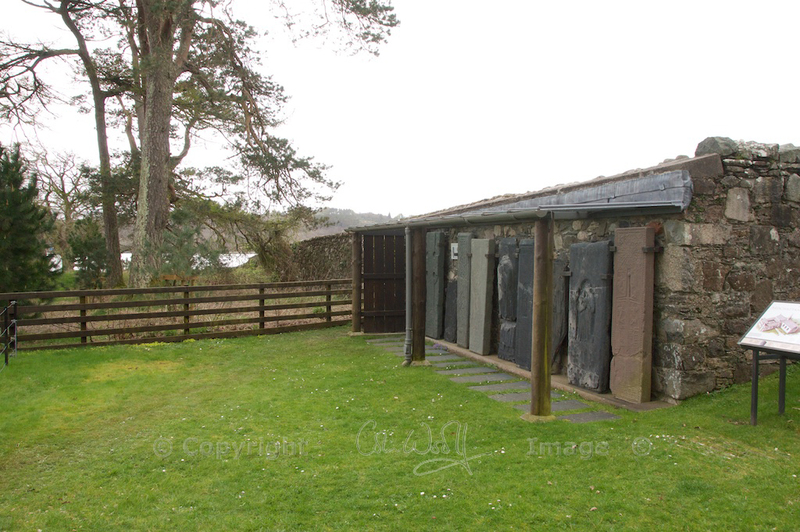 What is nice, is you normally have the site all to yourselves, which is lovely for taken photos and the loch is beautiful 🙂 PS No way could I open the box either, which is a shame because its a wonderful grave slab inside. Thank you, Lynne! I remember your photos, and thinking I just had to go there! Loch Etive is so blissfully peaceful and beautiful. I’m glad I wasn’t the only one who couldn’t open the box! 🙂 Next time I will try even harder! Terrific post! Love the photos! Thank you very much, Jeanette! I’m glad you liked the photos too. It was a real Scotch-mist type of day, but in fact it brought out the greens of the moss and the colours of the stonework really well. What a lovely post – this place looks wonderful! Thank you very much! It really is a lovely place, and in the most idyllic setting. I think you’d love it! I’ve never heard of this place – you’ve really conveyed how private and almost mystical it must feel. Looks like a great destination. Thank you! Isn’t it lovely?! I don’t think all that many people know about it. It has such an unspoilt feeling of serenity. LOVE, LOVE, LOVE these photos and stories, Jo! Thanks for sharing this wonderful adventure. BTW, those skull and crossbone carvings are eerie…Hank wonders if the carver might not have been a big kale fan, aside from the symbology thing. Heh. Hank himself finds it…green. Haha, thank you very much, Hank! That’s a brilliant idea about the kale carving! 🙂 I wonder I didn’t see it myself. It’s like a message in stone: “Eat too much cabbage and this is what you’ll look like.” Hank, you should come and decipher some Pictish symbols because you’ve obviously got an eye (or nose) for them! Ha! That’s Hank, alright. “Boldly Misinterpreting History Since 2000 CE.” What a dog! I am a MacDougall (some of us spell it McDougall) who lives in California and I am researching my trip to Scotland and found my way to your website. Thank you for the care in which you have in putting your website together. We will spend a few days in the Oben area to see the MacDougall castles, but coming to Ardchatten will be a must. How many clans can point at the headstone of their first three chieftains from the 1200s! Very cool! Hi Patrick, I’m delighted to have inspired you! Thank you so much for your comment. I think you will love Ardchattan Priory, and its setting is so beautiful. What a wonderful place to have in your heritage – and of course the MacDougall Cross, which is there too! 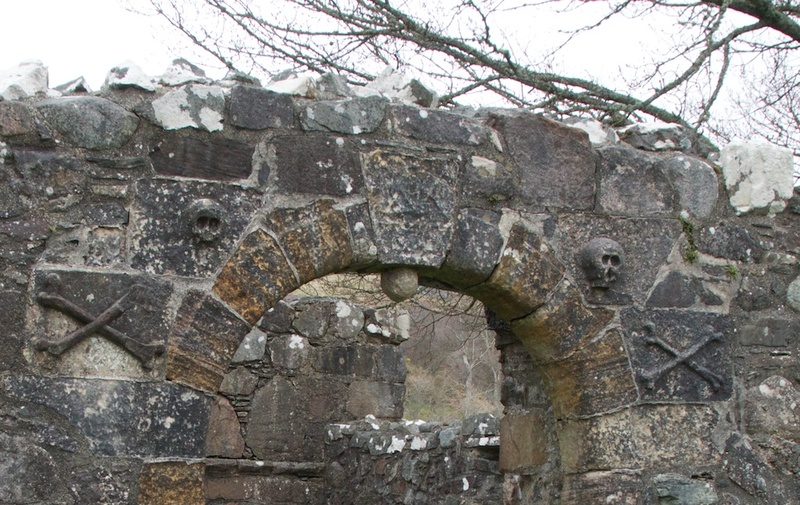 You might also like to investigate this place: it is the ruin of an old church dedicated to St Bride and it lies near Lerags, on a minor road a few miles south of Oban. I haven’t been there yet myself, but it is noted as having a ‘MacDougall burial aisle’. I’m attaching a couple of links: http://canmore.rcahms.gov.uk/en/site/22912/details/old+kilbride+kirk+and+kirkyard/ and this one (scroll down a short way) http://www.obanchurch.com/churchhistory.html The RCAHMS site gives you a good map of how to find it. How exciting – I hope you really enjoy your visit! Hi Glenda, that’s very interesting! If any readers can offer you some info I will be happy to put you in touch. Thanks for your comment, with best wishes – Jo. Glenda – proof read before post!!! lol!!! I will be coming over in April 2017, Ardchatten Priory, Family Headstones, and Ardachy House are high on my priority list!